At our Game Camp we offer our guests luxury self-catering accommodation in the middle of nature. The camp is situated at Brakwater, about 20 minutes drive from the CBD of the City of Windhoek. This game farm in the city has free roaming giraffe, oryx, springbuck, waterbuck, impala, nyala, warthog etc. etc. The Game Camp is a family owned luxury, self-catering, "tented" lodge, in the middle of nature, surrounded by birds and game, yet very close to the pulse of Windhoek - for those who would like to have the best of both worlds. The Game Camp is popular, not only for the international travellers and holiday makers, but also for corporate business visitors, preferring the relaxed farm atmosphere. This is also a favourite breakaway for Namibians during the week or over weekends. Our Game Camp, nicknamed the "Game Farm" is a stone's throw away from Windhoek, the capital of Namibia and in the centre of Namibia. It is the address to start and end your journey to and from Etosha National Park, Sossusvlei, Swakopmund or any other destination in Namibia. Safety is paramount to us, and our self-catering lodge is situated in an electrified fenced enclosure, only accessible from the radio controlled main gate. Our guests have the peace of mind, knowing, "no day visitors allowed". Windhoek is a malaria free area and Namibia is an Ebola free country. Our Game Camp does not cater for camping or day visitors. Windhoek is the capital of Namibia. With a population of less than 400,000 you would only call it a city by Namibian standards. It is quite a laid-back, clean and easy going place. There are a few sights, good restaurants and lively bars. In short it is a great place to start exploring Namibia. Set at the geographical heart of Namibia , Windhoek serves as the road and rail crossroads and the nerve center of the country's business and commerce. Windhoek has only existed for just over a century. The modern name Windhoek, or 'windy corner', originated from the original 'Winterhoek' during the German colonial occupation. At the time, it became the headquarters for the German Schutztruppe, which was ostensibility charged with brokering peace between the warring Herero and Nama. 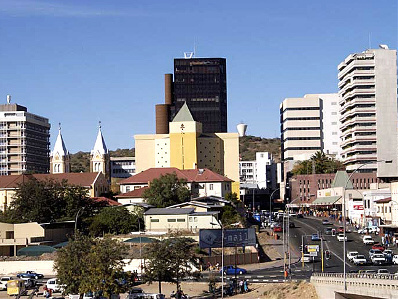 For over 10 years around the turn of the century, Windhoek served as the administrative capital of German South West Africa. Any of the several banks in the city center can exchange foreign currency cash and traveler's cheques into Namibia dollars. It has several fascinating historic buildings to explore, most of them conveniently located in the city centre. One of the main attractions in Windhoek, the beautiful Neo-Romanic style Evangelic-Lutheran Christuskirche was built in 1910. Tintenpalast (Ink Palace) is the seat of chamber of the Namibian Parliament, the National Assembly and the National Council. In the National Gallery of Namibia you can admire works reflecting Namibia's rich cultural heritage. The oldest building in Windhoek, the Alte Feste (Old Fortress) serves now as a National Museum of Namibia exhibiting Namibia's cultural history. 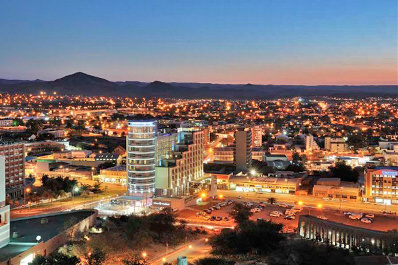 Windhoek is the business and transportation hub of Namibia. The Windhoek city centre is dotted with smalls shops and shopping malls and an ideal place for shopping in Windhoek. The city is home to numerous bars, discos and clubs with live African and European music. One of the very last, sought after, 50 hectare “ farms “ in Windhoek municipal area It is zoned as light industrial, domestic and for lodging and conferences. The property is fenced in with a 2,4 meter high electric game fence. Game: Oryx, waterbuck, springbok, impala, warthog, duiker and giraffe. The property houses a lodge, 2 houses, warehouses, granny flat and 3 separated chalets. Lodge: Consists of an office building with reception area, office, laundry, storeroom, kitchen, ablution, restaurant, bar and swimming pool. 8 x Luxury en-suite, self-catering “ tented “ chalets. Each unit with fully equipped kitchenette, veranda and private braai/barbeque. Managers dwelling: +- 400sm Under roof with open plan kitchen, lounge, dining room and TV lounge. Scullery, pantry, laundry, linen room, study, 3 bedrooms, 2 bathrooms, double garage, braai/barbeque area, swimming pool and en-suite guest room. Main dwelling: 865sm, Thatched and corrugated iron roofs. Huge open plan lounge, TV lounge, entertainment area, dining room and kitchen. Scullery, built-in cold room, walk-in safe, home cinema, 3 bedrooms, 2 bathrooms, linen room, lapa with braai and Jacuzzi on wooden deck, loft stydy/office outside balcony, swimming pool, 4 vehicle garage, storeroom and servant quarters with 2 bedrooms, lounge/kitchen/ stoop and sunken boma filled with Namib dune sand. 2 x Workshops/warehouses of 187 and 132sm. Convert main house to a boutique hotel. Private hospital or recovery hospital.